Last week Brett and I discovered that Mark needs a lot more sleep than Molly or Isabella require. This is a major problem since Mark and Molly share a room and Molly wakes up Mark in the morning. So like the good parents that we are, we decided to put the girls in the same room. We decided to test drive this new roommate situation before I moved Molly's crib into Isabella's room. The girls were so tired from not napping on the drive home that they fell asleep instantly. No problems and smooth sailing. Note Brett was not working this night. The girls giggled for a few minutes but settled in pretty quickly. Good sign! Isabella was in Molly's crib when I went in to get them the next morning. No longer a good sign. 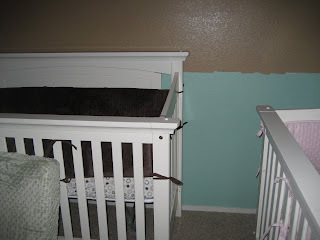 This is a work in progress picture from when we were setting up the nursery. If only I realized then that the cribs would one day be too close together. Mommy has discovered the source of the problem. Isabella can grab onto Molly's crib and slide into it. AWESOME! AT 10:30 a very ticked off Mommy moved a very heavy dresser and Isabella's crib so getting into Molly's crib was no longer possible. At 11:30, they finally fell asleep. But have no fear, they woke up at 7am the next morning. Sigh. We made the move and put Molly's crib in Isabella's room. Tonight will go better right? Nope, Isabella has learned how to open the door from her crib and is calling for mommy every few minutes. Night 3 without Daddy to help, sign. I will not go in there and engage the girls and tell them to be quiet. At 9, they finally fell asleep. And yes I did go in there, but only because Isabella called out that she pooped her pants. And she did, but Molly was asleep during all of Isabella's antics. So what have I learned from the last week? Molly is used sleeping with someone, and Isabella is not. They are waking up super early and falling asleep late, much to my dismay. But this is all temporary and I'm sure the novelty of having a new roommate will wear off soon. Did you notice that the night when Brett was home everything went great? Yeah, that's not lost on me either. Also it makes me sad to separate the twins. It just feels like they should be together. If you have a helpful suggestion for me, I would love to hear it. Don't miss out on a chance to win an amazing personalized name frame. You can enter my giveaway here. I know how you feel about separating the twins. I felt sad about that when we had to do it too, but Ky will wake up whoever is in his room and recruit them to be his partner in crime so it had to be done. Your girls will get used to the new situation, but it may take a few weeks. Hugs! I always wonder how parents deal with a multiple crib situation like that. I can't imagine how much trouble my peapod would get into if she had a roommate to encourage her! As it is, she loves to trash her room when she wakes up in the morning! No suggestions just hugs! It will get easier! I'm dropping by from the Alexa Hop with my sparkly little toolbar! I'd appreciate it if you would swing by A Helicopter Mom and comment!.